The life vests finally arrived in Guanaja. We thank Roland for his support organizing the transport of the vests from La Ceiba to Guanaja. 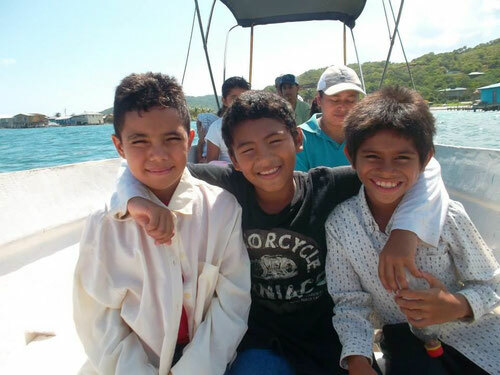 The kids are happy and looking forward to making their next excursion. Safe and sound! The public school "Cristobal de Colón" is situated in Bonacca, the main village of Guanaja. Bonacca or "the cay" - that´s how the local people call their village - is located on a cay, about 500 yards off the main island. Leaving the cay is only possible in a boat. The school students need life vests to make their excursions to the main island safer. They are involved in a reforestation project which successfully plants mangroves on the Guanaja shores which had been destroyed by Hurrican Mitch in 1998. 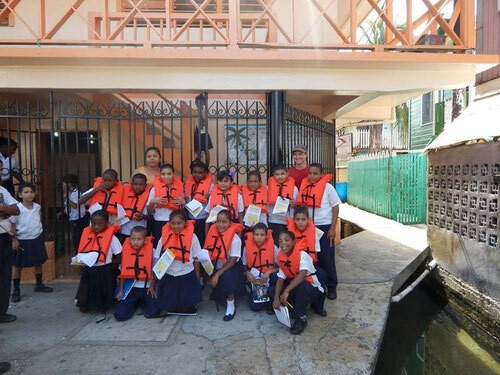 One life vest costs 8 US $ and we need about 15 vests right now since 15 students fit into one of the boats they use for their excursions. The guardian angels buy the vests in the US and ship them to Guanaja which will cost another 2 US $. These kids should wear life vests in the near future.